Välkommen till Studentforum LTH. Registrera dig om du vill skriva nya inlägg. Även om du bara vill läsa kan det vara bra att vara registrerad - då ser du lätt när det kommer nya inlägg. Welcome to the Computer graphics: Introduction to 3D discussion forum! Here you may ask questions about the labs or other issues. Teachers/assistants will be present here, but students are highly encouraged to participate. Course-related announcements might pop up here as well, so make sure to stop by on a regular basis. Någon som behöver en partner för uppgifterna? Anyone needing a partner for the assignments? Behöver du fortfarande en partner? I så fall samarbetar jag gärna! Det gör jag, så då kör vi tillsammans! Lägg till mig på facebook, heter Pontus Bondi Eriksson! If you are getting the RenderChimp code to work on OSX, check out Jacob's first reply on the 2013 forum. försöker få RenderChimp att fungera på OS X 10.9.4. Har installerat SDL och SDLimage efter vad som stod i forumet för 2013. Jag får dock detta felmeddelandet "No architectures to compile for (ARCHS=x86_64, VALID_ARCHS=i386)." Har googlat utan framgång så om någon vet vad som är fel får ni gärna hjälpa till! RC still has 32bit dependencies. Någon som behöver en partner? For OSX 10.9, you need to make the following changes. Hello. I have downloaded SDL.frameworks version 1.2.15 and SDL_image.frameworks version 1.2.12 for mac OSX and put them both into my /Library/Frameworks folder. I have also updated the changes mentioned above regarding Glee.h and GLint casting. However now I am getting an error in PlatformOSX.cpp of "SLD_image/SDL_image.h" file not found. I've tried to change this to simply SDL_image.h but it cannot find that file and I have tried renaming the SDL_image.h file in the SDL_image.frameworks but that doesn't work either. Anyone else running MAC OSX 10.9.1 and Xcode 5.1.1 having the same problem or know how to fix it? thank you. Seems like it works for me now so maybe this will solve the problem. In the bar to the left with the file system, navigate to frameworks->linked frameworks. At first my "SDL_image.frameworks" was marked red and the path/location was wrong. So if this is the case then change the path/location to "/Library/Frameworks/SDL_image.framework". 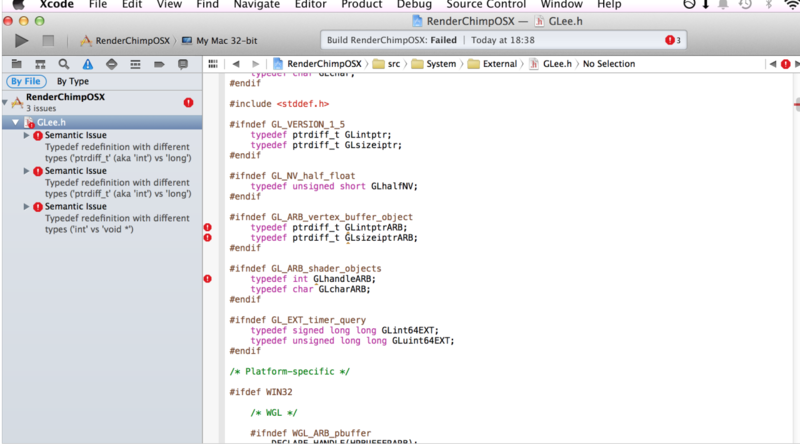 This can be done in the bar to the right when you mark "SDL_image.frameworks". It shows it as a valid path. It should have Linked Frameworks->SDL_image.frameworks->Frameworks and Headers-> (in Headers) SDL_image.h and only this header. This is what mine shows, is that correct? I also need a partner if anyone else does. I'm a student at UCLA in California and I don't speak any Swedish. My name is David Scheibe.